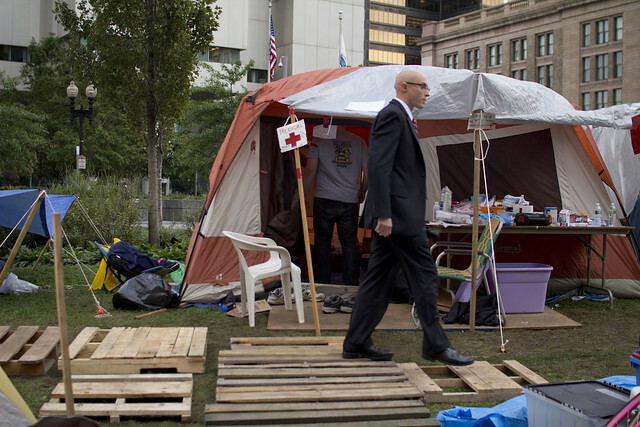 I attended a general assembly at Occupy Boston on Thursday night and I got to see, as the slogan goes, “what democracy looks like.” A week earlier I’d attended the initial planning session and thought the group was laughably over-organized. There were subcommittees, a series of hand gestures, and a complicated procedure for calling on speakers and making decisions. At thursday’s meeting the reason for all that process became clear: it’s really, really hard to get passionate individuals to stay on topic. We spent an hour discussing (arguing would be too strong a word) whether to add a specific general idea to a list of ideas that will be considered for inclusion on a document in the future. That overstates things a little: a lot of the discussion was clarifying whether or not the specific topic would be announced right away, or if it would be held back until the whole document was done. The worry was that by announcing this single topic, the media would assume this was the primary concern for the group. This was an important discussion to have, and I think everyone was happy with the decision that was reached. But it’s easy to see how, based on the rules of process, it will be hard to come to an agreement on actual details. Right now anyone can veto a proposal, and as the vague amorphous anger becomes more specific someone is going to be annoyed with the result. As an example, either the Paul-ies are going to be mad that Ending the Fed isn’t a major priority, or a non-Paul-y (like me) is going to be mad that Ending the Fed is a major priority. As long as a decision hasn’t been made, every protester assumes that the group agrees with him or herself. The Boston protest is still in its early stages, and the facilitators running the meetings are still getting a hang of the complicated process. I think they need to have a stronger hand and make sure the process is going ahead as it’s been defined. Then, as the rest of the people learn the rules it will get easier to stay on topic. There are always going to be idiots who offer a “friendly amendment” as an excuse to inject whatever personal pet issue they are obsessed with, but they’ll just be like the annoying radio show caller that gets shut down quickly. The support for the movement is growing daily, with unions, (more unions), ice cream manufacturers, and general folk of all stripes joining up. And with a high degree of tolerance coming from the Boston Police, I think Occupy Boston will have the time they need to mature.